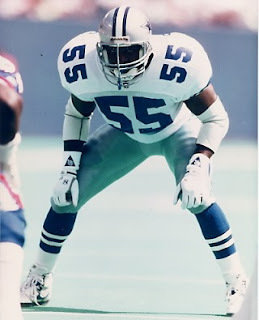 Jones was taken in the first round of the 1992 NFL draft (24th overall) and stepped immediately into the starting lineup at middle linebacker to replace departed veteran free agent Jack Del Rio. While lacking ideal size, he made up for it with speed and aggressiveness, although he regularly came out of the game on passing downs. Cowboys went 13-3 to finish first in the NFC East while leading the NFL in rushing defense (1244 yards/ 77.8 yards per game) and ranking second in fewest points allowed (243). Won NFC Divisional playoff over Philadelphia Eagles (34-10), NFC Championship over San Francisco 49ers (30-20), and Super Bowl over Buffalo Bills (52-17). Following a good but somewhat erratic rookie season, Jones lost his starting job in 1993. He regained it in ’94, thanks to the defection of Ken Norton Jr. to the 49ers as a free agent, and led the Cowboys in tackles but continued to lack consistency. Following one more year in Dallas, Jones signed with the St. Louis Rams as a free agent in 1996 and, exhibiting the same problem with uneven play, lasted two seasons before moving on to the Miami Dolphins, where he recorded a career-high five sacks in ’98 and played three years before finishing his career with Washington in 2001. Overall, while fast and good enough to start during most of his 10-season career, Jones never fully lived up to his first draft choice – or Rookie of the Year – potential.